Drs. Pelcman’s Practice has its own dental lab and technicians on-site. This provides flexibility and also makes it possible to be in direct contact with the people making the dental crowns and veneers. Working with the best possible materials and quality controls, and with their own highly qualified and talented technicians and doctors, the on-site lab allows Dr. Pelcman to provide the best possible results for crowns and other prostheses, which may be used during dental implants treatment. At Drs. Pelcman’s cosmetic dentistry practice in Argentina, we are aware of the value of your time and we are staffed and prepared to finish your treatment in the least time possible (up to 30 percent less than regular dental offices), but always consistent with the highest professional standards. You will be able to save time and money (spending less in accommodation, etc.). Porcelain crowns are fixed prostheses that allow us to modify, create or restore different features of the teeth such as shape, size, color, position and function. Thus, they can be used to achieve different objectives, such as prosthetic and/or esthetic. 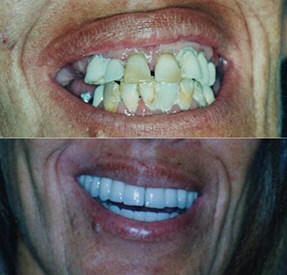 Teeth that have been damaged by large caries, abrasions (due to bruxism or the wear throughout the years), fractures, esthetically poor (see also pure porcelain crowns and porcelain veneers), or with large restorations, or crowns with filtrations (old crowns), are indicated for this type of treatment. The porcelain used to make the crowns is “VITA 3-D Master” which is high-quality porcelain from Germany that can reproduce any wanted shade of the teeth. 1st Appointment: First day (approximately half an hour). You will meet Buenos Aires dentist Dr. Pelcman and his staff, and get to know the facilities. You will also have a clinical and computerized evaluation of your case. 3rd Appointment: Fifth day (approximately half an hour). Try out of the structure of the crowns. 4th Appointment (get ready to smile! ): Ninth day (approximately 1 and a half hours). Cementation of the crowns. Although an ideal treatment should not take more than approximately 10 days, we recommend scheduling a 15-day stay. Pure porcelain crowns are, as redundant as it may sound, made of pure porcelain. These have many advantages, such as: less removal of tooth is necessary to install the crown, porcelain is a highly biologically compatible material and create excellent aesthetic results. Pure porcelain crowns allow the dentist to regulate the color, shape, position and size of the tooth (all to a greater extent than porcelain veneers). The porcelain used to make the crowns is “VITA 3-D Master’; a high quality porcelain from Germany that can reproduce any wanted shade of the teeth. 2) An understanding of the limitations of the treatment, and having a clear idea of what you want to achieve. 3) Your anatomic features play a role in the treatment. An evaluation by the dentist will determine if you have sufficient bone structure and quality to sustain the crowns. Aesthetically poor front teeth from bicuspid to bicuspid (when they cannot be corrected using porcelain veneers). It is contraindicated for patients that grind or clench their teeth. 1st Appointment: First day. You will meet Dr. Pelcman and staff and get to know the facilities. You will also have a clinical and computerized evaluation of your case. 2nd Appointment: Second day. You will have your teeth prepared in order to receive the crowns. Impressions are taken and temporary crowns are made. 3rd Appointment: Fifth day. Cementation of the crowns. Although an ideal treatment takes no more than approximately 10 days, we recommend a 15-day stay. Get ready for dazzling smiles. Porcelain veneers are thin veneers that are cemented on the front of the teeth. They allow you to change the color, shape and size (to a certain extent) of the teeth with a minimum removal of dental tissue (crowns require a greater loss). This treatment is indicated for esthetically poor teeth, teeth that cannot be whitened by regular ways (porcelain veneers are the only way to whiten your teeth permanently), teeth with gaps and teeth with an irregular alignment. The porcelain used to make the veneers is “VITA 3-D Master” which is high-quality porcelain from Germany that can reproduce any wanted shade of the teeth. 1st Appointment: First day (approximately half an hour). You will meet Dr. Pelcman and staff and get to know the facilities. You will also have a clinical and computerized evaluation of your case. 2nd Appointment: Second day (approximately 3 hours). You will have your teeth prepared in order to receive the veneers. Impressions are taken and temporary veneers are made. 3rd Appointment: Fifth day (approximately 1 and a half hours). Get ready to smile! Cementation of the porcelain veneers. A new generation of restorations. Porcelain inlays and onlays are fixed restorations that are cemented in the tooth. These are upgraded types of restorations that have many advantages in comparison to the composites and amalgams. These are “indirect” pure porcelain restorations, this means that they are made in the dental lab where all the details are taken care of. Both the esthetic and functional results are exquisite. The porcelain used to make the crowns is “VITA 3-D Master” which is high quality porcelain from Germany that can reproduce any wanted shade of the teeth. Although amalgams have proven to have a high durability over time, they are not aesthetically pleasing. In contrast, composite resins are beautiful, however they are not resistant over time and they have to be frequently changed by the dentist (this causes a small loss of dental tissue, an economic burden and a loss of time for each change). Porcelain inlays and onlays gather all the pros from amalgams and composites (durability and aesthetics), plus they are less porous (this means that they won’t shelter bacteria), they present color stability and they are biologically compatible. 1st Appointment: (approximately half an hour) You will meet Dr. Pelcman and staff and get to know the facilities. You will also have a clinical and computerized evaluation of your case. 2nd Appointment: (approximately 1 hour) The old restoration is removed and the tooth is prepared in order to receive the porcelain restoration. According to the preparation, the restoration will be called an inlay, when the restoration fits in the tooth, or an onlay, when the restoration fits in the tooth and covers the surface of the cusps. Impressions are taken. 3rd Appointment: Fifth day (approximately 1 and a half hours). Cementation of the inlays.